A B O V E A N D B E Y O N D H O N I N G © 2 0 1 8 S u n n e n , S t. L o u i s , M O U S A I - 1 8 - 2 There's more than one way to machine a bore. Only Sunnen has them all. No matter what your bore machining application…from primary hole drilling to final finished bores…we have a turnkey solution for you. 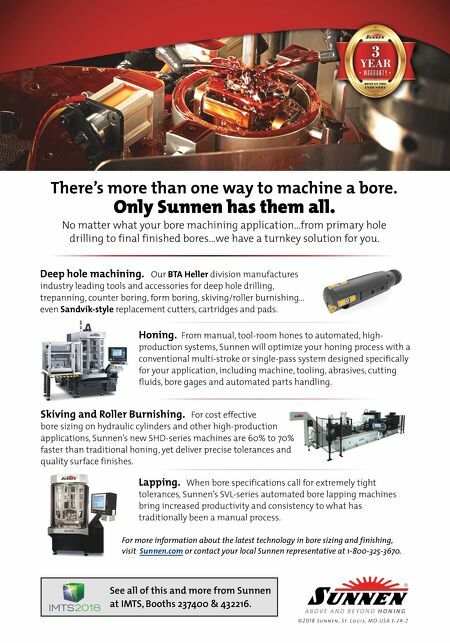 For more information about the latest technology in bore sizing and finishing, visit Sunnen.com or contact your local Sunnen representative at 1-800-325-3670. Deep hole machining. Our BTA Heller division manufactures industry leading tools and accessories for deep hole drilling, trepanning, counter boring, form boring, skiving/roller burnishing… even Sandvik-style replacement cutters, cartridges and pads. Honing. 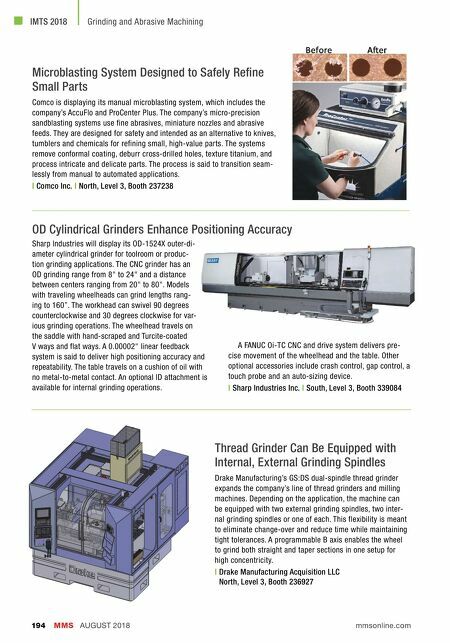 From manual, tool-room hones to automated, high- production systems, Sunnen will optimize your honing process with a conventional multi-stroke or single-pass system designed specifically for your application, including machine, tooling, abrasives, cutting fluids, bore gages and automated parts handling. Lapping. When bore specifications call for extremely tight tolerances, Sunnen's SVL-series automated bore lapping machines bring increased productivity and consistency to what has traditionally been a manual process. Skiving and Roller Burnishing. For cost effective bore sizing on hydraulic cylinders and other high-production applications, Sunnen's new SHD-series machines are 60% to 70% faster than traditional honing, yet deliver precise tolerances and quality surface finishes. See all of this and more from Sunnen at IMTS, Booths 237400 & 432216.